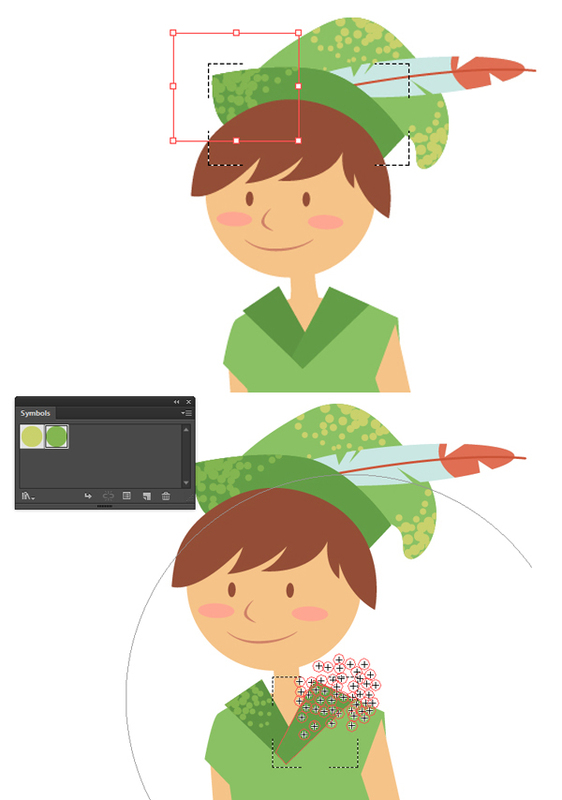 [Illustrator] Learn How To Draw Robin Hood From Scratch! 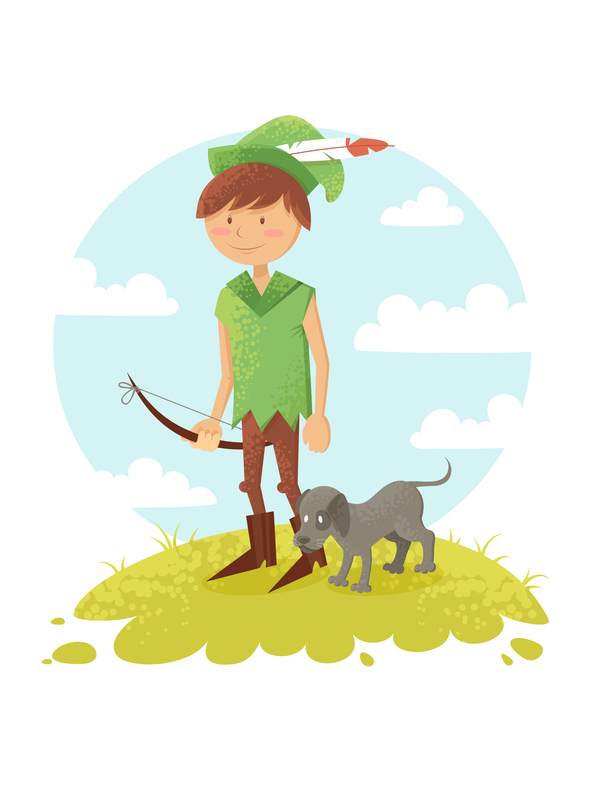 In this tutorial, we’ll learn how to draw a funny little Robin Hood boy and his pet with Adobe Illustrator. We’ll be using simple forms and Pen Tool (P) for the basic elements, as well as try out an interesting technique of making a textured fill with the help of the Symbol Sprayer Tool (Shift+S). Let’s get started! 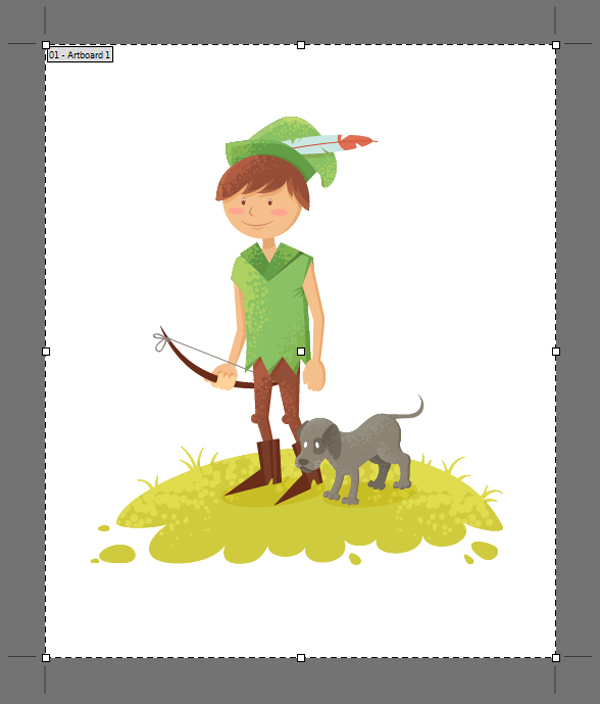 File > Place your sketch on the Artboard and double click on the sketch layer to turn it into a Template,dimming theimage to 50%. 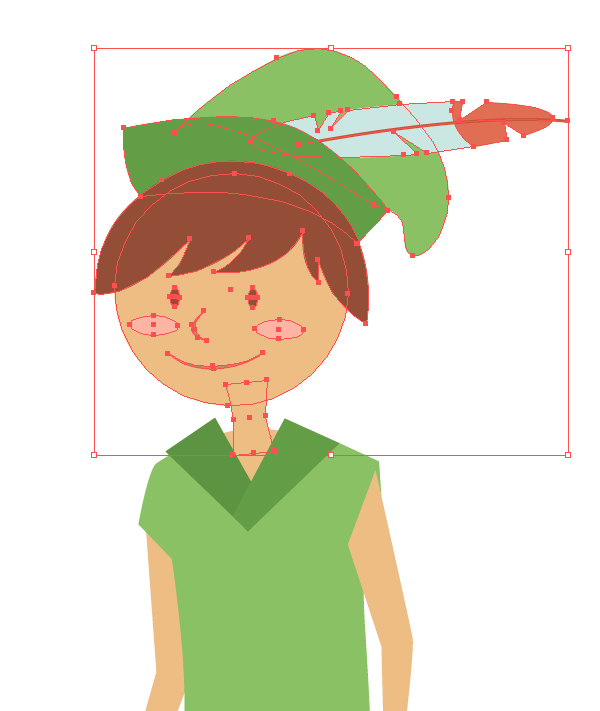 Start by placing a circle above the boy’s face with the Ellipse Tool (L) and fill it with light skin tone. 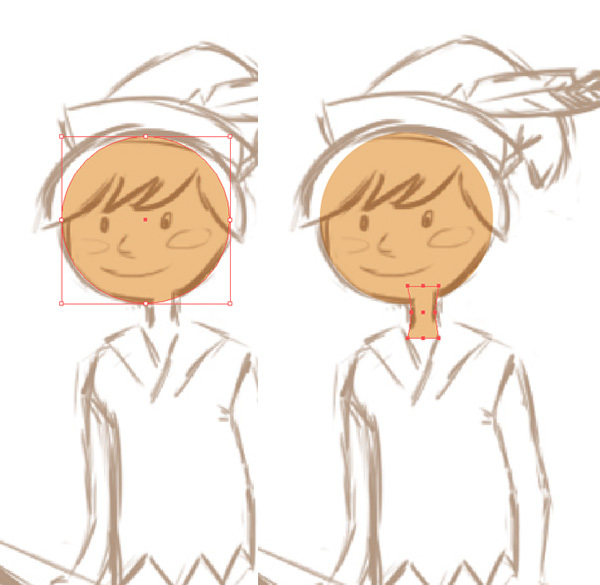 Add a small neck using the Rectangle Tool (M) and move its side anchor points closer to the center to make the form more flowing. 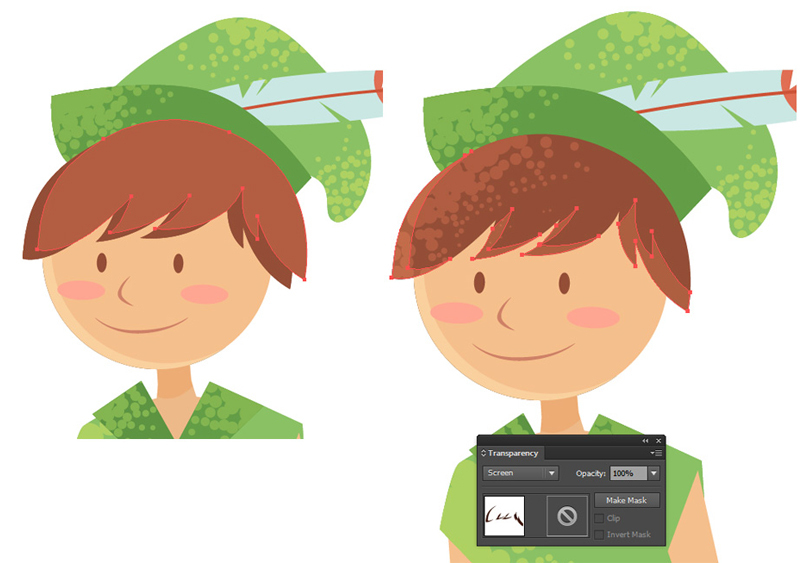 Grab the Pen Tool (P), switch the Fill color to chocolate brown and start shaping the hair. 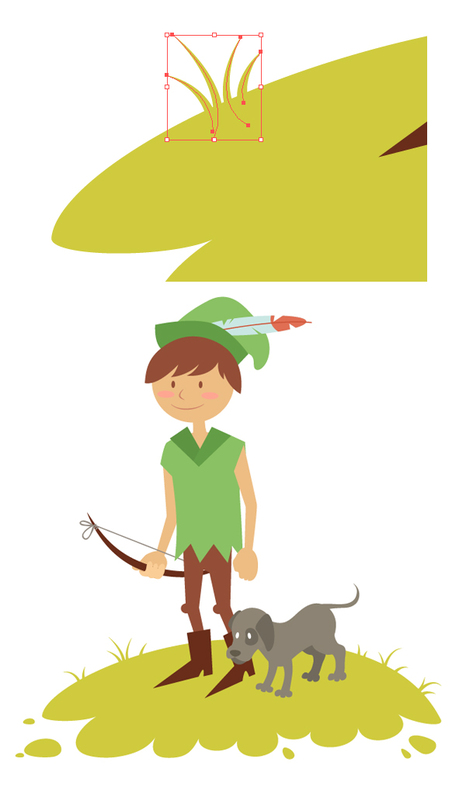 Add a green Robin Hood hat, making its folding slightly darker than the other parts of the hat. Make a squashed ellipse to form a feather. 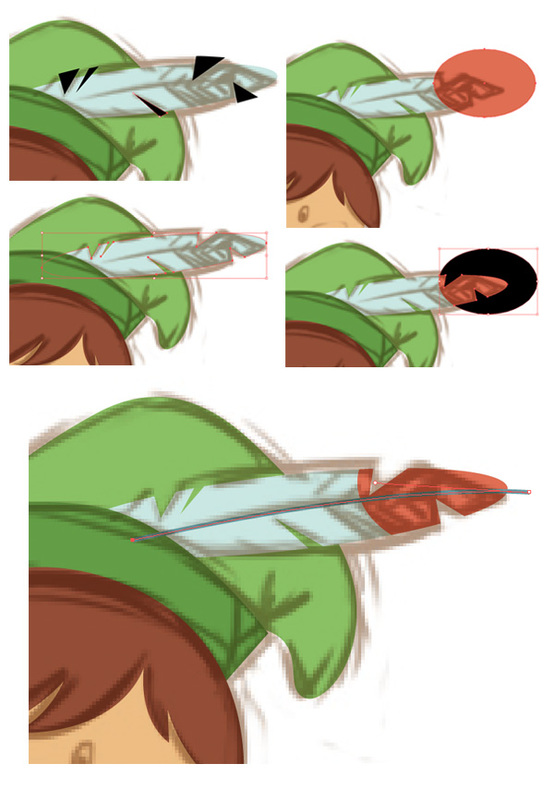 Let’s make the feather more detailed and recognizable! Add a few triangles (black on the screenshot), select them and turn into the Compound Path (Control-8). Use the Shape Builder Tool (Shift-M) to cut off these triangles, making the feather sliced. 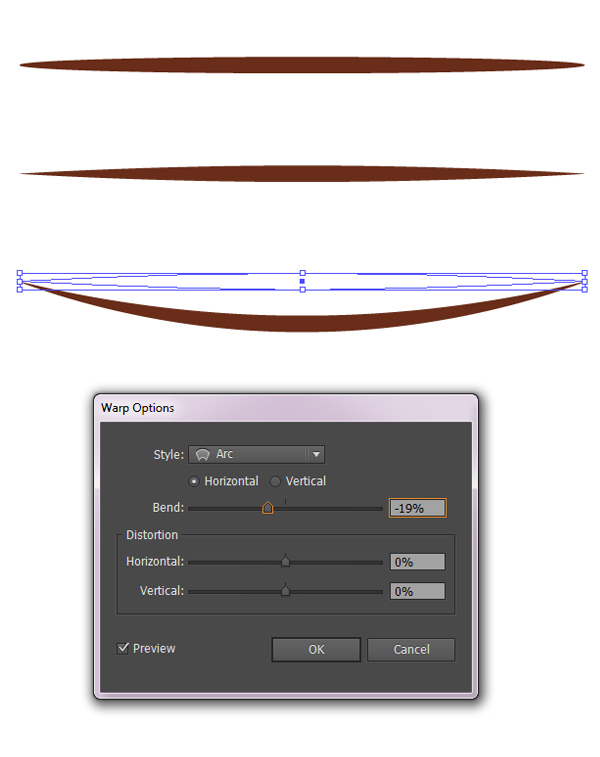 Add a red ellipse above the basic feather shape and form a tip, using the Shape Builder Tool (Shift-M) again. Finally, add a line with the Line Segment Tool (\), forming the feather shaft. To form a neckband, create a green rectangle and rotate it about 45 degrees. Move the upper anchor points using the Direct Selection Tool (A) to make the upper part wider. 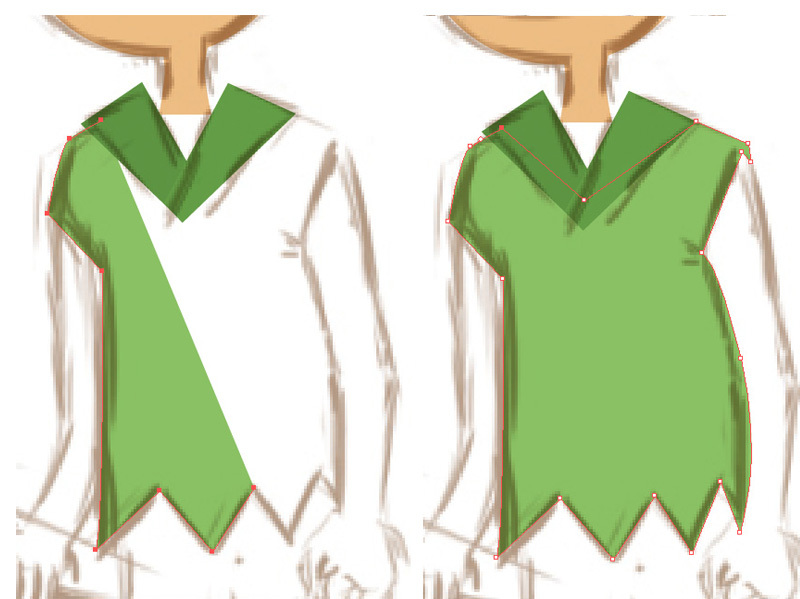 Then, use the Reflect Tool (O) to reflect the neckband copy to the other side of the shirt. Use the Pen Tool (P) to form a simple shirt made of straight lines. 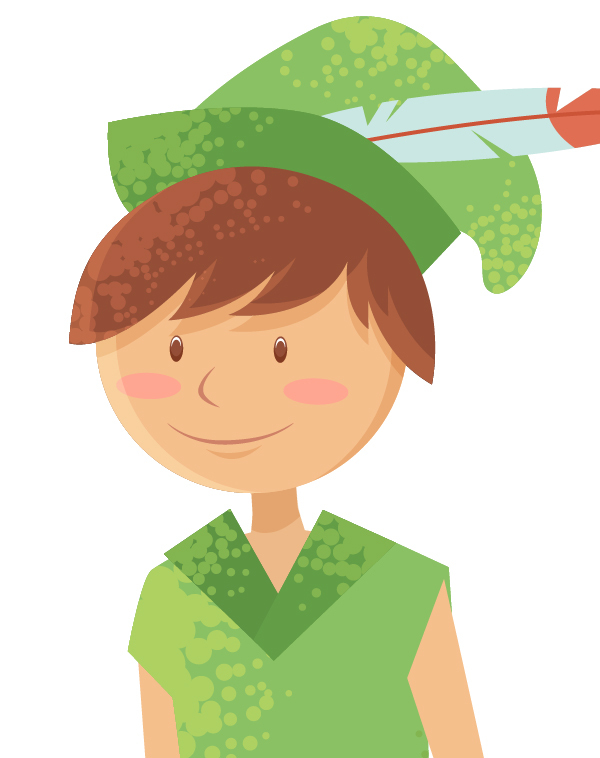 Use the Eyedropper Tool (I) to pick the color from the boy’s hat. 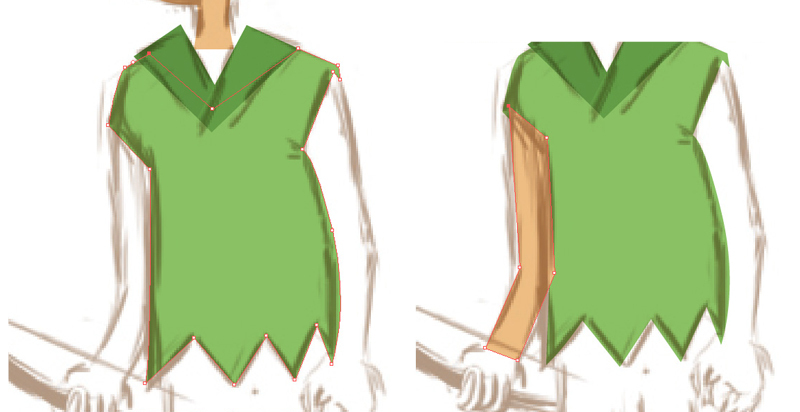 Start shaping out the arms now. 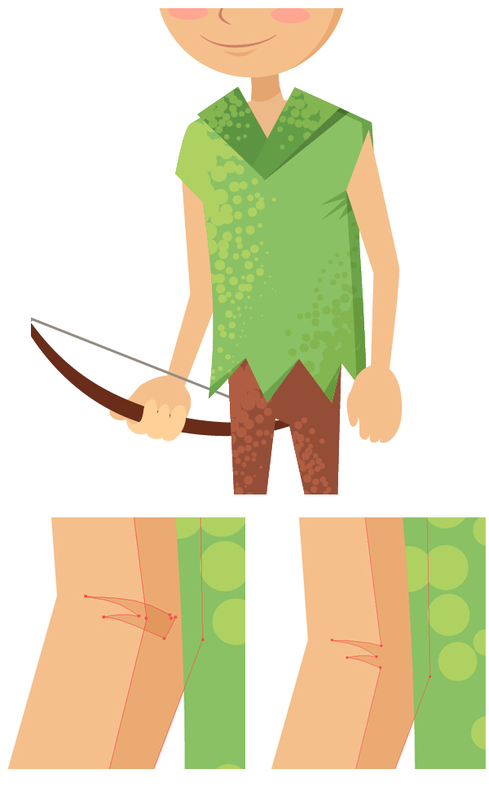 Draw a circle for the fist and use the Pencil Tool (N) to form simple curved fingers and add the second arm. 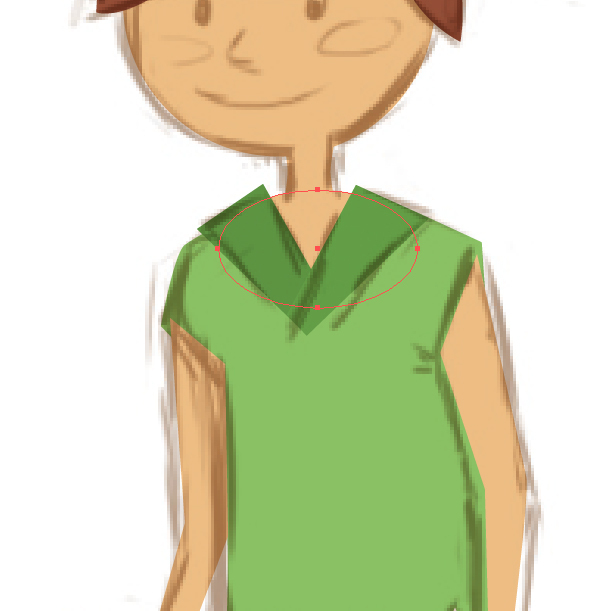 Add an ellipse to mark his chest and shoulders. Move on and draw out the pants. Pick the color up from the boy’s hair. 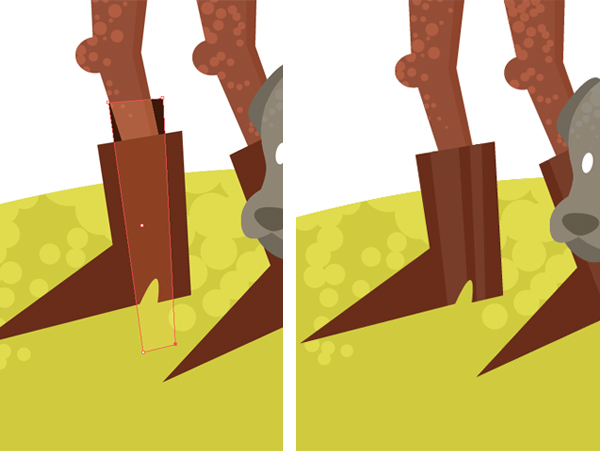 Add two tiny circles for the knees and finish up by forming a pair of funny sharp boots with the Pen Tool (P). 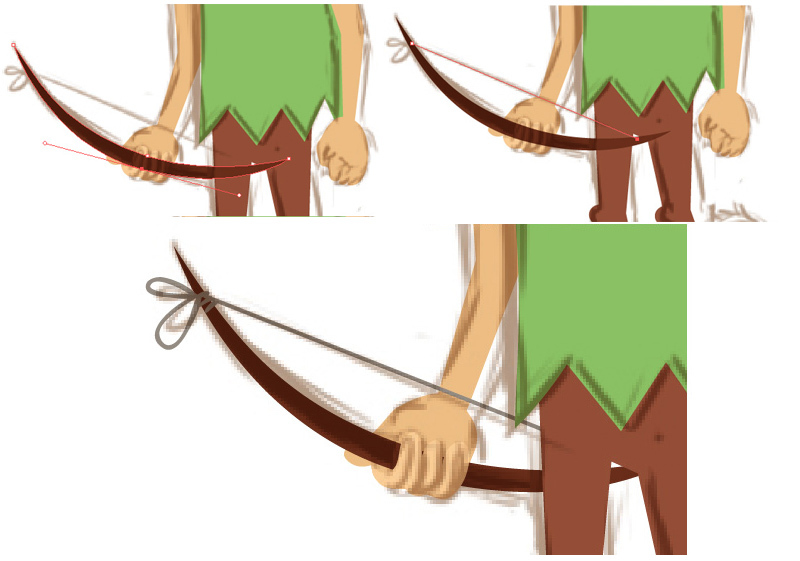 Let’s form a simple arched bow. Start by making an extruded shape with the Ellipse Tool (L) and convert its side anchor points to corners, making the tips sharp. Go to Effect > Warp > Arc and set the Bend slider to -19%. 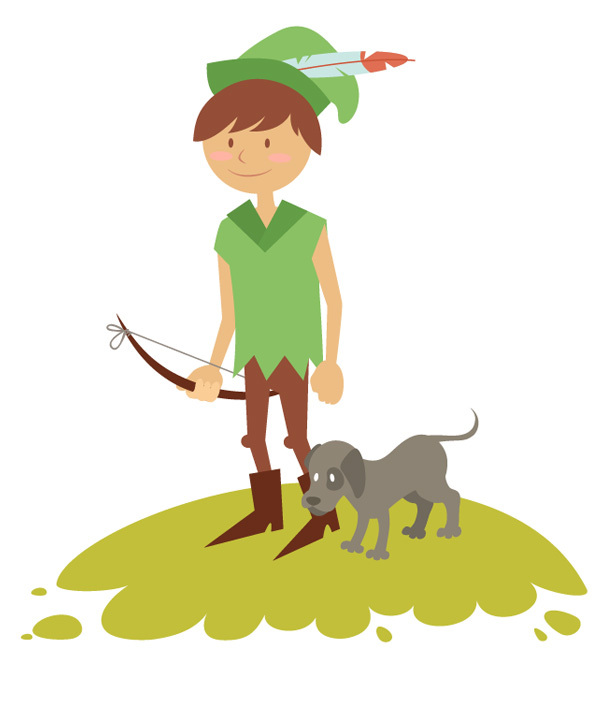 Put the bow in the boy’s hand and draw a straight line for the bow-string. Add a couple of tiny loops, to make the picture more cartoonish and funny. Let’s move to the boy’s pet. 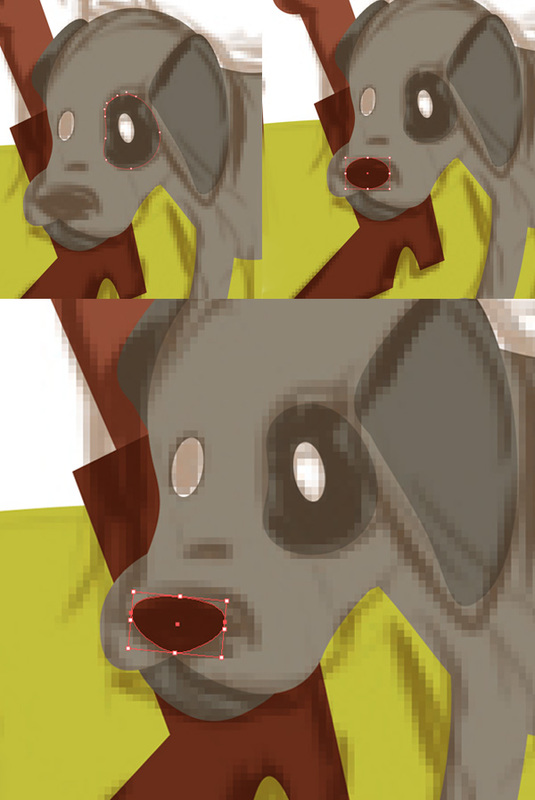 Render its head by connecting two grey ellipses with a freehand shape, to form the dog’s skull. Make a jaw, filling it with a slightly darker color and add a cute triangle for its ear. 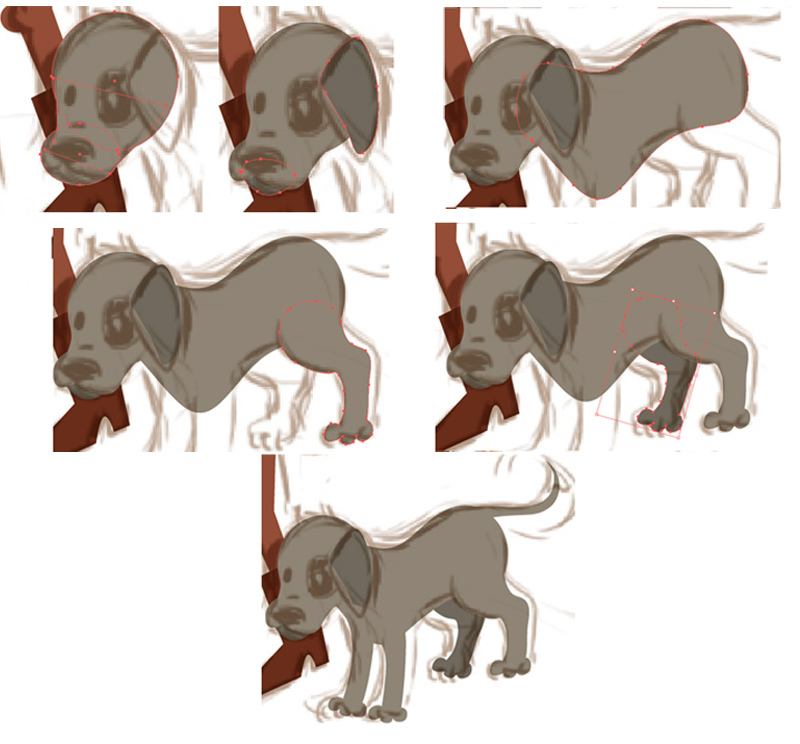 Use the Pencil Tool (N) to draw out its body with a single flowing shape and add the legs. Make the back leg darker to show the distance from the viewer. We need to render some ground, so that our characters won’t be floating on air. Put a nice green ellipse behind all other objects (Shift-Control-[). 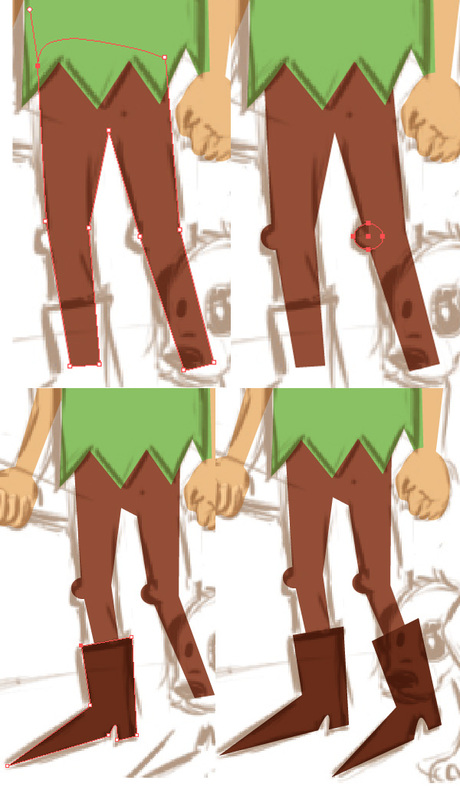 Draw a freehand shape with torn edges (black on the screenshot) and use the Shape Builder Tool (Shift-M) to cut off the parts that are not needed. Add a few spots here and there to give the ground a fancy look. 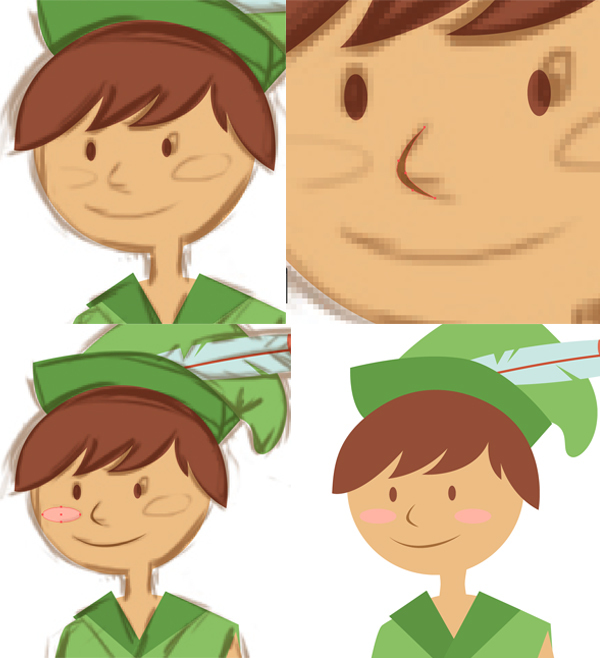 Make the boy’s face more detailed by adding a pair of cute eyes, a thin line for the nose and two pink spots for the gentle blush on his cheeks. Form the lacking details of the dog’s eyes, nose and a dark spot around the eye. Let’s add the finishing touch to the ground by making a simple grass brush. Make an even circle and drag its right anchor point to the right. Convert the anchor point to corner and squash the shape slightly. 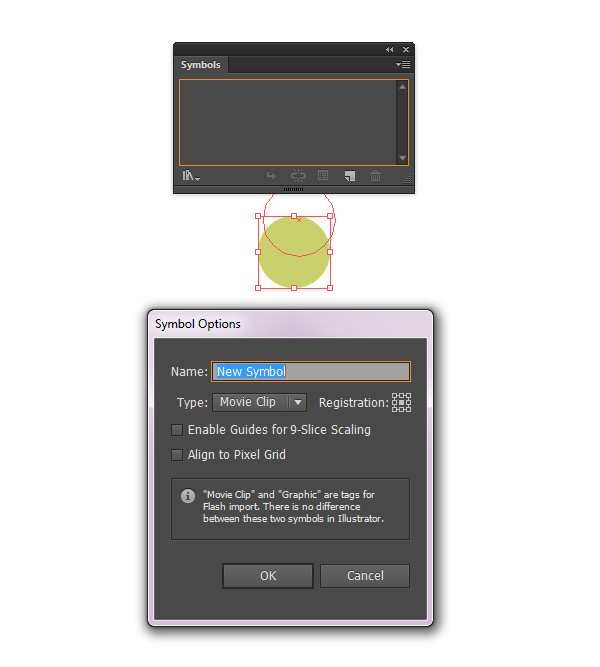 Drag and drop the newly created shape to the Brushes panel and create the Art Brush with default settings. Let’s move to the fun part and make our picture more whimsy and textured! 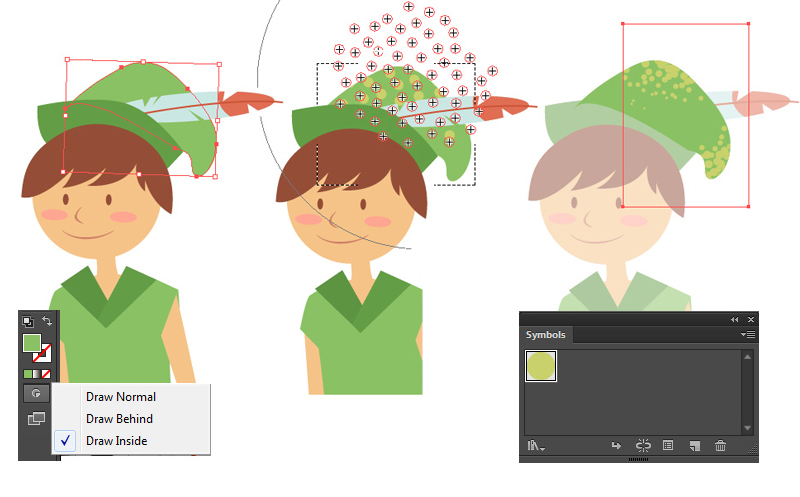 Select the upper part of the hat and switch to Draw Inside mode (Shift-D). Grab the Symbol Sprayer Tool (Shift-S) and start spraying the created circle-symbol over the upper part of the hat. Use the Symbol Sizer Tool to make some symbols smaller and the other larger, so that they overlap each other, forming rough textured spots. Move the symbols around with the Symbol Shifter Tool to fit the composition perfectly. Create another symbol of a darker green color and add texture to the hat folding and the neckband. 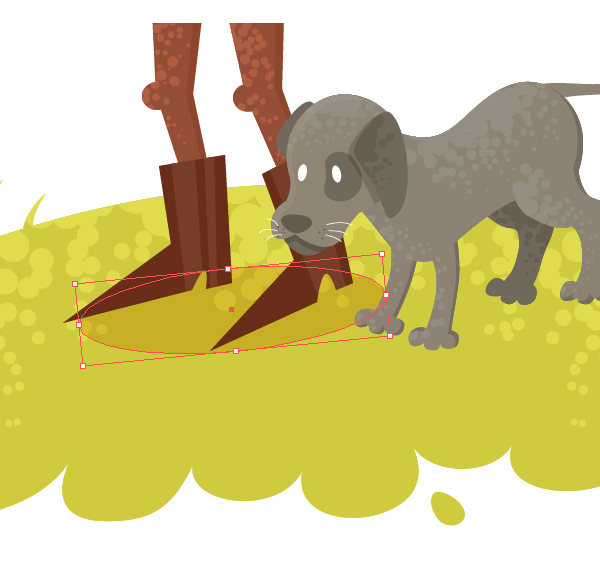 Continue applying the texture to the boy, his dog and the ground using the same method. Let’s add some shadows and highlights to make our picture more dimensional and alive. Copy and Paste in Front (Control-C > Control-F) the boy’s hair. Move the upper copy up and to the right, and use the Shape Builder Tool (Shift-M) to cut off parts that are not needed. Switch the newly created shape to Screen mode, forming the highlight. 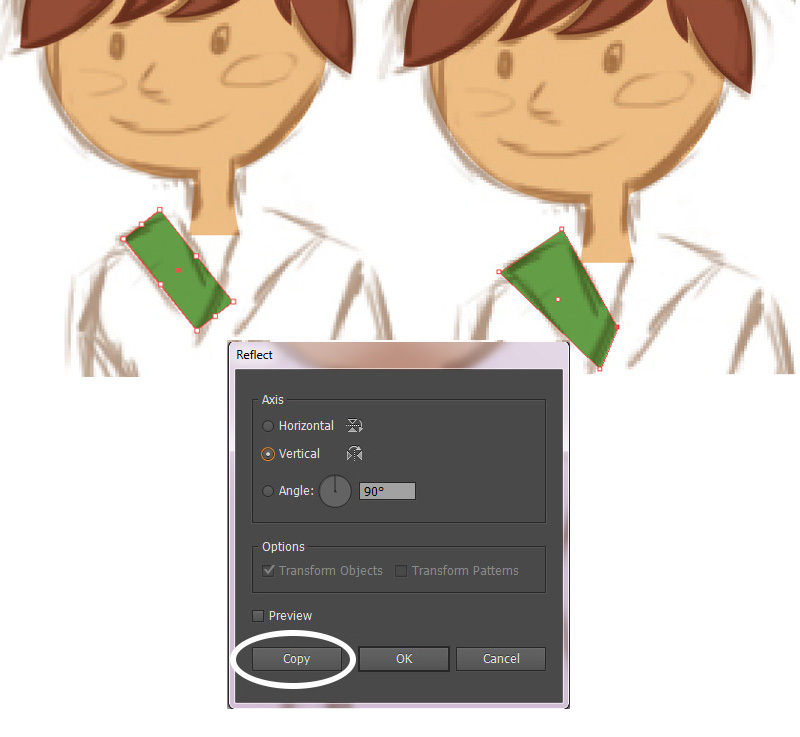 Use the same technique to add shadows on the boy’s face and neck, switching the Blending Mode to Multiply. Continue making shadows all over the body, making the figure more vivid. Draw separate shapes (as I did with the elbow bend) and Unite them in Pathfinder into a single shape. Add some highlights to those boots to make them shine! 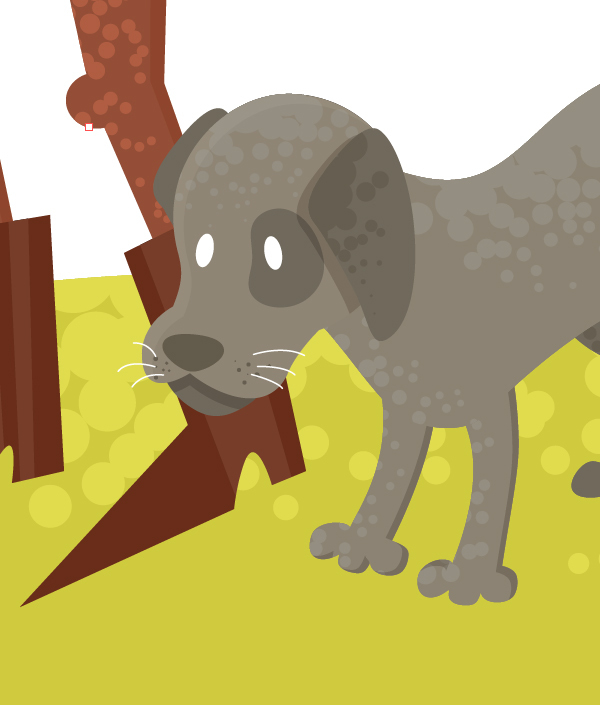 Don’t forget to add some details to our doggy – put the shadow under its ear and on the jaw. 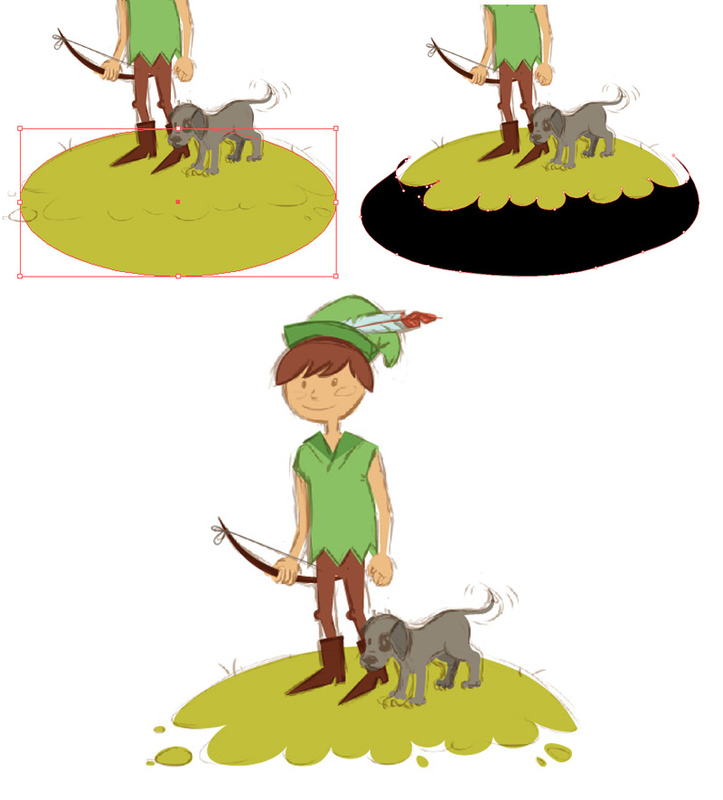 Put a shadow under the boy’s and dog’s legs, so that our characters stand firmly on the ground. Switch it to Multiply mode and adjust the color. The main elements are completed, however the compositions needs more space. 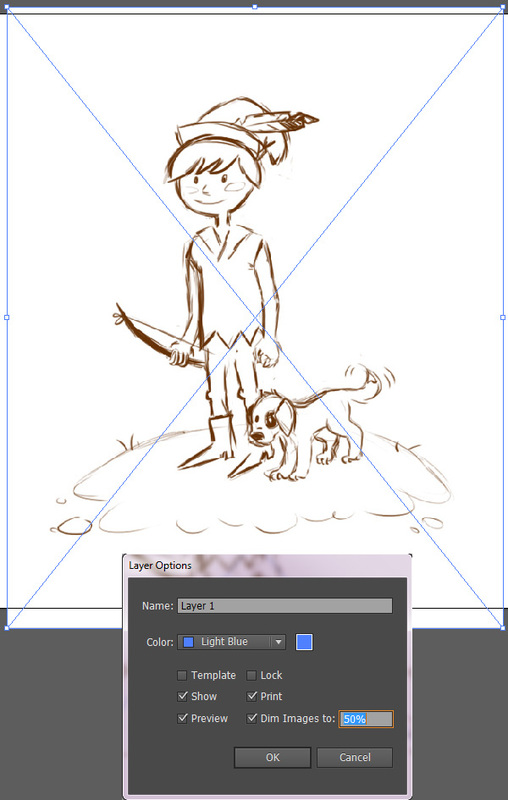 Select the Artboard Tool (Shift-O) and change the size of the canvas, so that the characters fit nicely in it. We need some bright spot on the background, so let’s add a piece of blue sky here. Make an ellipse behind all other objects and draw a simple cloud using the Pencil Tool (N). Let the cloud cross the sky edge, so that some part of it blends nicely with the white background. Congratulations! 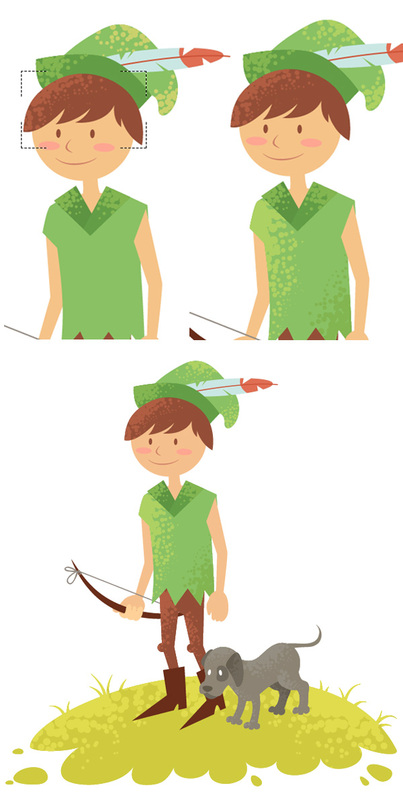 Our Robin Hood is finished! More clouds here and there and – voila! – the composition is complete! 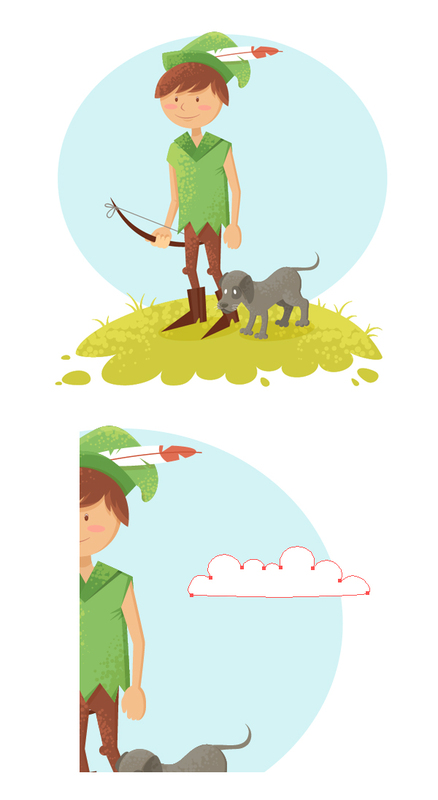 I hope you’ve enjoyed drawing Robin Hood and found some useful techniques in this tutorial. Let your inspiration guide you!